WASHINGTON (The Nil Admirari) - Earlier today, Republican presidential candidate Senator Ted Cruz (R-TX) announced his plan to kick a baby in the face. The statement followed Cruz's mocking of Vice President Joe Biden, who lost his son Beau to brain cancer on Saturday and is burying him today. "I will be kicking a baby in the face later today to make sure everyone is clear about what kind of guy I am," stated Cruz. An unidentified member of the press asked Cruz what baby he planned to kick in the face. "Great question. The baby I have selected is Hillary Clinton's granddaughter Charlotte Clinton Mezvinsky," said Cruz. Another member of the press inquired about why Cruz selected Charlotte. "I think it's a good idea to put Hillary Clinton on notice and let her know I am gunning for her. 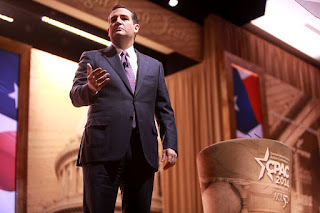 Kicking her grandchild in the face will do that," answered Cruz. Reporters were wrapping up with the senator when Secret Service agents arrived and informed Cruz they needed to speak with him in private.